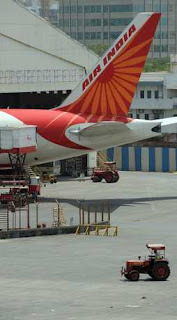 Police in India have arrested two Air India employees after uncovering a people smuggling operation at New Delhi airport that apparently targeted Nepalese quake victims. A senior police officer at the airport said staff at the national carrier were suspected of helping Nepalese women promised jobs in wealthy Gulf countries to evade immigration procedures. So far 28 women have been identified, most of whom police said were from areas of Nepal badly affected by a major earthquake in April. M.I Haider, deputy commissioner of police at the airport, said the scam was exposed on July 21 when a group of seven Nepalese women transiting Delhi airport en route to Dubai were detected with their travel documents stamped, even though they had not yet cleared immigration control. Police briefly detained the women and arrested two Air India ground staff, who admitted under questioning that they had been paid US$90 per person to arrange the forged documents. The airline did not return calls for comment. “Security personnel caught a group of seven Nepalese women who had been issued their international boarding passes and travel documents without following the proper procedure,'' Haider told AFP. Police found the 21 women when they raided a hotel in Delhi and they will be returned to Nepal along with the other seven, Haider said. Two suspected traffickers were also arrested, both Nepalese nationals. The women had travelled to India from Nepal by bus after being promised work in Gulf countries. They flew from Delhi to the western city of Ahmedabad before boarding a flight to Dubai via Delhi – a convoluted route apparently aimed at evading immigration procedures.